Two nights of Aleve and rounds with IcyHot patches did nothing to help my neck, so today I made my way to the doctor. Who said she felt the spasms on the side of my neck. And sent me promptly to x-rays while guessing a herniated disc. I am purposely not going to google “herniated disc” because I don’t want to know worst case scenarios right now. Two days to wait for x-ray results and a prognosis. When I can’t turn my head left or right, I happen to think that’s a little crazy. In the meantime, I left with two prescriptions and the advice to get a heating pad and use it non-stop, rest, and not work. Oh yes, and no driving while taking one of the meds. I tried to explain that this is all well and good, but doesn’t really work for a single working mom. No work, no pay. And there is this matter of two kids that need constant care. So for now, I hope for the best and try to forget the story Mystic told me some months ago about when he had surgery for a herniated disc and was out of work, um, for awhile. Luckily his symptoms were way more severe, so me and my rose-colored glasses are pulling for a pinched nerve, pulled muscle, or something decidedly less serious than surgery and heavy recuperation. How about some crab cakes now instead? We are super partial to Weight Watchers crab cakes and make them a few times a year, including for our annual New Years’ Eve Seafood Feast. But I saw this recipe the other day, from Easy Restaurant Recipes via Pinterest, and when I saw the directions, it seriously said make me now. No, it didn’t really say that. But it did say mix, fry and eat. When I said “stupid simple” yesterday, I meant it. I changed a teensy bit of the recipe along the way, mostly to lighten it up and make use of ingredients I had on hand. I’ve never been to Joe’s Crab Shack so I can’t tell you if these are a good copycat recipe. What I CAN tell you is that they are amazingly good. Slightly crispy and full of crab goodness. Simple to make. And totally worth ten minutes of your time. But then again, most things are worth ten minutes, right? Such a small investment. Just one caveat. They were okay reheated, but not as out of the world as they were fresh from the pan, so best to eat them when you make them, and not save for later. And with that, my kiddos are fed and bathed and moments from bed. Which means, time to reheat the heating pad and hit the hay, wishing miracle neck cures for the morning. A girl can dream, right? A year ago today … need a way to use up the last of summer’s strawberries? This is the ticket. Two years ago today … breakfast for dinner? why the heck not? Three years ago today … ahh yes, the olden days when there was menu planning. Four years ago today … Grilled Peanut Chicken, don’t mind if I do. Five years ago today … guilty pleasures and clearly before I became a wordsmith. Six years ago today … muffins, just muffins. 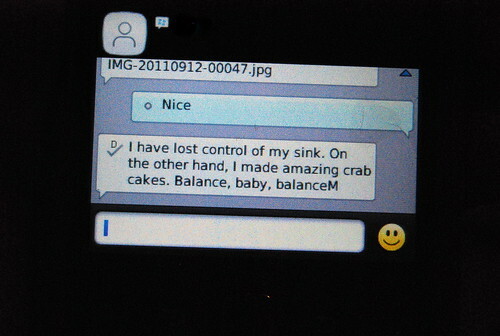 A few months back, my sink was empty, which prompted Mystic to comment, “so THAT’S what your sink looks like!” He was kidding, of course. He is just way better at the having-an-empty-sink thing and I, well, I know it will be there when I get to it. He’s very much a clean as you go cook. I am totally and completely not. I cook. Enjoy time with whoever. And deal with it later. 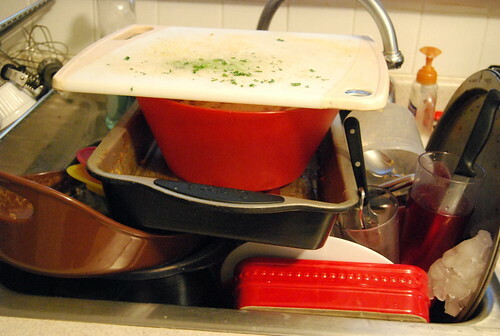 And I cook a lot so even though I empty the dishwasher at least once a day, sometimes twice, the sink fills up quickly. We also don’t use disposable anything, so that doesn’t help. Well, it helps the environment, not so much my workload in the kitchen. All in good fun. One of the strong fibers in our relationship is humor. A topic for another day. Ok, I will now have to try that crab cake recipe… maybe a fall date to go crabbing is in my future! I’ve got rose colored glasses on for you, too… glad to see the kids are already in bed so you can get that much needed rest! Hope you are feeling better tomorrow! I agree stay away from Google. My suggestion is to let your friends and family help you — you give so much, so you can certainly take some. Oh, never made crab cakes, or used crab for that matter. Do I just get it at the fish counter at Whole Foods, or my local fish place? Anything to look out for/know? Betsy – sorry I missed your question – ack! You can get crab at the seafood counter of your favorite grocery store (usually canned) or at your local fish monger. I’m with Patsy…I’m hoping for something minor! I made and ate crab cakes for the first time last year and was surprised how much I love them! Definitely trying these babies. I’ve never eaten Joe’s Crab Cakes; but, yours look fantastic. I need these in my life. soon. I hope your neck starts feeling better soon and that you get a good report from the doc. Swooon. What’d you serve ’em with? Wonder if I could use this recipe with salmon? 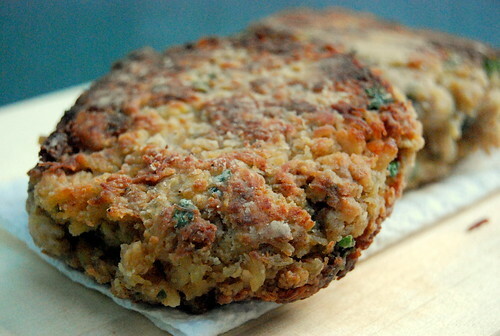 Just found your site looking for crab cake recipes and these look awesome can’t wait to try. Wondering if I could bake them instead of frying? and substituting salmon sounds awesome too! Never got back to this but yes I baked them and they were great! I used foil sprayed it a little with Pam and then sprayed the top of the crab cakes with a little Pam. I haven’t tried this recipe yet with salmon but I had found a similar recipe for salmon cakes that were suppose to be fried and I baked those also and they turned out great. Thank you so much for the recipe. Love crabcakes, I will try these soon. Also looking for a recipe for ‘Maryland-style’ crabcakes. I lived in Maryland as a small child and as I grew up my Mother & Father would always talk about the crabcakes they had in Maryland. Sorryvto go on as I did. Thank you for the recipe! Also wanted to tell you I hope you feel better soon[ (since this is June I’m sure you are) the last comment I read was from February]. But I did want to mention by your description it sounds like you had Torticollis-stiff neck. Search-out a good chiropractor. Many people and other doctors don’t like chiropractors but I have worked for one for 15 years and have seen about 98% of those patients come back-it’s a ‘healthy’ way to feel better. I’d better sign off, talk (text) too much! did you try to google it? or youtube? (I don’t know how to do that but I know my daughter gets many of her recipes there). What is blackening seasoning and what do you recommend? Could you leave that out without changing recipe too much of flavor? Is it very spicy? Thank you…look forward to making these. It’s a slightly spicy creole/cajun blend, and yes, you can leave it out and they will still be just as yummy. Can’t wait 2 try this recipe ! How is your neck feeling ? Any better ? yes, thank you, all better! That’s great ! Glad to hear it ! These are good but not really that close to Joe’ Crab Shack crab cakes. Theirs don’t have as much “filler” and have more crab. Try using Old Bay Seasoning instead of the other spices, one whole egg, no mayo and half the breadcrumbs. Joe’s is a really fun restaurant – Cajun style – great décor! thank you. I will try yours, Gigi. I don’t like lots of spices that take the taste of the natural food. I have only liked ONE place that have good (recipe) for crabs and French snails. I tried many places didn’t like any other. Making 4oz patties….how many patties can one expect to make of the whole recipe? Recipe sounds delicious(I love seafood!) and I will definitely try these. Can you use fake crab that u find in the grocery store? How can you call this recipe “Joe’s Crab Shack Crab Cakes”, since you’ve never (even) been there, nor actually ate theirs? I ‘ve determined that you must be ‘guessing’ the recipe. Anyhow, what kind of ‘crab’ did you use in this recipe…. crab from a can, or ‘fresh lump crab’ from the local seafo0d store….or from the seafood section of your local supermarket? Also, how many Crab Cakes does this recipe yield? I’m surprised that ‘your’ recipe doesn’t contain any “Old Bay Seasoning”. I’m a New England native, and “Old Bay Seasoning” is used in almost all seafood dishes, especially in “Crab Cakes”! Have eaten at Joe’s Crab shack in Tennessee and their Crab cakes were delicious. I’m not a big fan of Maryland style cakes but do like Joe’s and Bonefish. It’s just my husband and me so am interested in the yield of the recipe. I’ve read through other comments where same question was asked but you didn’t respond to yield question. Where could I find the recipe for the blackened seasoning ?